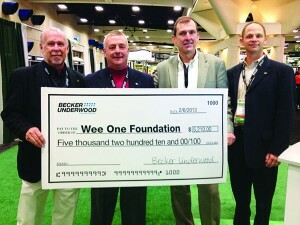 Steve Cook (second from right) representing the Wee One Foundation along with Chad Ball, Paul Bastron and Luke Cella at the 2013 Golf Industry Show. One chapter ends and another begins in the storybook career of Steven M. Cook, CGCS, MG. Cook confirmed for Golfdom today that he has resigned his position as director of agronomy at Oakland Hills CC, Bloomfield Hills, Mich., and accepted the same position at Medinah (Ill.) CC. Cook had just completed his 20th year working at Oakland Hills, where he hosted a Ryder Cup, a PGA Championship and two U.S. Amateurs in his time at the club. He said it was tough leaving Oakland Hills, but Illinois is home. Cook says he is looking forward to not only a new challenge at Medinah, but also a bigger challenge. Cook says it will be a “few weeks” before he makes the move. He resigned yesterday and details were still being worked out. Cook says it will be difficult to pack up his office on his last day. Cook, one of the few professionals in the industry to be both a Certified Golf Course Superintendent and a Master Greenkeeper, has had an impressive career. Prior to his time at Oakland Hills, Cook worked as superintendent at Wakonda Club in Des Moines, Iowa (1992-1997) and as the superintendent at Golf de Joyenval in France (1990-1992). The University of Illinois grad has multiple marquee events on his résumé, including the 2008 PGA Championship and the 2004 Ryder Cup.